My parents showed me what it was to write; the daily application of time and energies with no promise of reward other than the faint hope of a good line or two set down by day’s end. My father, Joseph Whitehill, was an award-winning short-story writer, and twice a novelist. Precious Little remains my favorite of his works. My mother, Cecily Sharp-Whitehill, is a fine and spare poet, though these days she mostly edits lengthy and weighty case studies with an elegance that far exceeds what might ever be required or expected. Her letters, now emails, are all keepers. To my folks then, I owe the example, and the desire to yarn in words, first on paper, and now in the digi-verse. For me, the work began with custom-writing audition monologues so my actor friends could showcase who they truly are in one minute or less. I figured that their headshots looked just like them. Their resumes reflected their skills and experience. Why audition with a piece written for somebody else? After extensive interviews and more time crafting their pieces, my friends booked their gigs. This made me proud, to be their secret weapon. Then came the screenplays, some festival wins; the television work, and the decent ratings. It was bound to happen that my agent, and dear friend, Matthew Bialer, at Sanford J. Greenburger, would suggest tackling a novel. Okay, Matt. But where to begin? What to write about? Scott B. Smith showed me the way. His book, A Simple Plan was simply riveting to me. I could not put it down until I smashed into the brick wall of its ending. And then I had it; an ancient theme around which I could wrap my story: the dreadful and mortal burden of sudden wealth. In my case, I wondered what substance other than gold was at once so fraught with legendary corrupting powers, and so damn bundlesome to lug around? Beginning in youth with the fable of The Golden Touch, through the comedic musings in the film The Lavender Hill Mob, gold would be the object of desire for my novel. From this exploration, Deadrise was born. In A Simple Plan, Mr. Smith has a wonderful eye for the specifics that help characters come to life. Forget two dimensional characters, or even the Hollywood critics’ vaunted yet clichéd three. There are more facets to each and every denizen of A Simple Plan than gleam on the Hope Diamond. What would credibly cause ordinary men and women to alter their behavior to commit acts that, if discovered would put them beyond the pale of society, put them in jail, or perhaps land them in a mass unmarked grave? Mr. Smith’s answer is different for every character. How does a decent woman who is expecting her first child believably transform into a schemer to shame Lucrezia Borgia? Read A Simple Plan, and gape agog as a Madonna becomes a Macbeth. Without spoiling anything, I can hint that every person in the story changes because at the core, they fear that the yeomanly life they foresaw before the money appeared, might, if the money is taken away again, become a living nightmare. The influx of wealth is a family problem in A Simple Plan. Anyone who has lost a relative with a last will and a pittance or a bauble to bequeath understands this. The resentments fester even as loyalties are challenged and sides are drawn up. The sense of disappointed entitlement blooms like a red tide, suffocating the more generous feelings of less extraordinary times. At least a will confers order and structure to the process of splitting up shares. With a mass of money and no societal or legal norms attached, only the honor of thieves can light the way forward to the day when the abstract wealth can become an actual jingle in the characters’ pockets. Mr. Smith demands that his characters wait before they can reap the rewards of their darker decisions. And in that time of waiting, the weaker souls (would we love them as much if they were stalwart?) heed the Sirens’ call toward self-destruction. Scott B. Smith creates characters wonderful in their decency, then makes them an offer they are helpless to refuse. When they begin to surprise themselves and mistrust each other, he steps back, and watches them betray the things in life that they cherish most. Read A Simple Plan. Ask what you would do if your walk in the deep winter woods turned out the same way. I must tip my hat to Mr. Smith a second time for so ably making the transition from novelist to screenwriter. In adapting A Simple Plan into a feature film of the same name, he has achieved something truly great. Even though a few elements of the story changed in the transition, the film hangs together like a gallery in the Louvre. Please do not cheat yourself out of experiencing the book by thinking the movie says it all. Just know that the film, like the book, comes from the hand of a master storyteller. 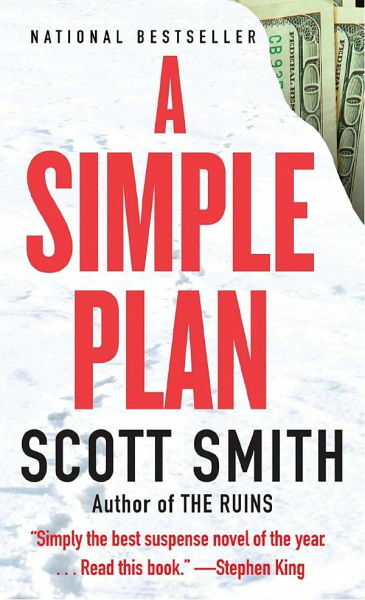 Watch A SIMPLE PLAN and you will be spellbound as Mr. Smith’s characters slowly unwrap the winding cloth from around their souls and discover the fiends within.